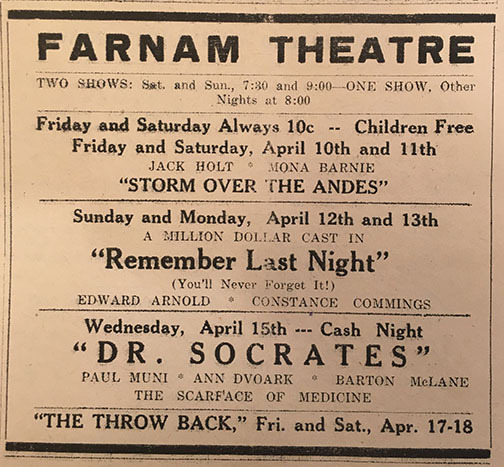 A fire, which started just as the show commenced, Wednesday evening, caused considerable damage and excitement at the Farnam theatre. The films caught on fire, and although the flames could be seen shooting out of the small windows through which the film is projected, the crowd filed out in an orderly manner. It is thought that the film was wound on the reel backwards, causing the film to ignite, as the first film of the main show had just been started. Loren Fitch who was operating the machine, turned the fire extinguisher on the flame, which caused the fumes to come so dense that he was forced to descend from the booth through a small window on the side. The fire department was summoned and the blaze was soon extinguished. As we go to press the extent of the damage to the machines is not yet known, but it is planned that shows will be resumed Sunday evening.